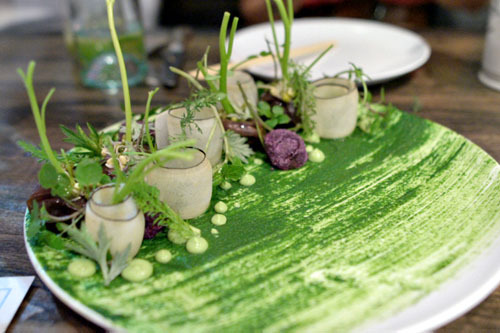 Without a doubt, one of Los Angeles' most controversial restaurant openings of the past several years has been that of Jordan Kahn's neo-Vietnamese-y canteen Red Medicine, mostly due to the whole Virbila brouhaha. It's been nearly two years since that debacle. Red Med's put the incident behind them, and hopefully, so have LA diners. Or maybe not. I get the feeling that Angelenos still harbor a bit of resentment over RM's inauspicious debut. The place doesn't get much love around here, but rather, much of its praise seems to come from visiting foodies, chefs, and other luminaries. 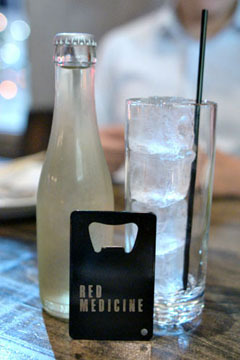 And in fact, it was indeed a visit by Opinionated About Dining's Steve Plotnicki (who's based in New York) that got me to return to give Red Medicine another go. 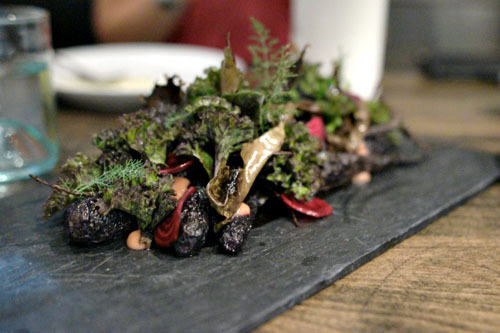 As far as Red Medicine's menu goes, it retains much of the same vibe that it had before, though there's less of an emphasis on smaller plates I'd say. We ended up ordering just a couple dishes, and let the Chef decide the rest. To drink, you'd be remiss if you skipped the cocktails (which are as creative as ever), but there's a smartly-curated selection of wines as well from GM Noah Ellis if that's your thing. Click for larger versions. 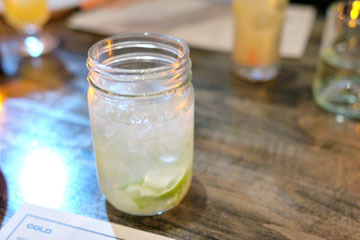 #73 - Novo Fogo Silver Cachaca, Lime, Sugar [$12.00] | Muddled and served in a mason jar / 'Caipirinha'. Shake hard five times. Service method stolen from Dragos Axinte. 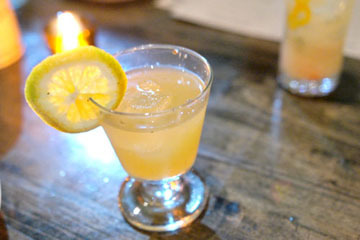 #75 - Germain Robin Craft Method Brandy, Calisaya, Sakuma Bros. Oolong Tea, Orange, Lemon [$11.00] | Served chilled with an orange slice and grated clove / Adam's punch, using exclusively American ingredients. Three cocktails to begin: I ordered #73, which was basically RM's excellent version of the classic caipirinha, with a great, complex balance of boozy, tart, and even slightly savory flavors. #75 was also very nice, with a lovely mix of fruity, herbal, and delicious tea-like overtones, all over a great base of brandy--yum. 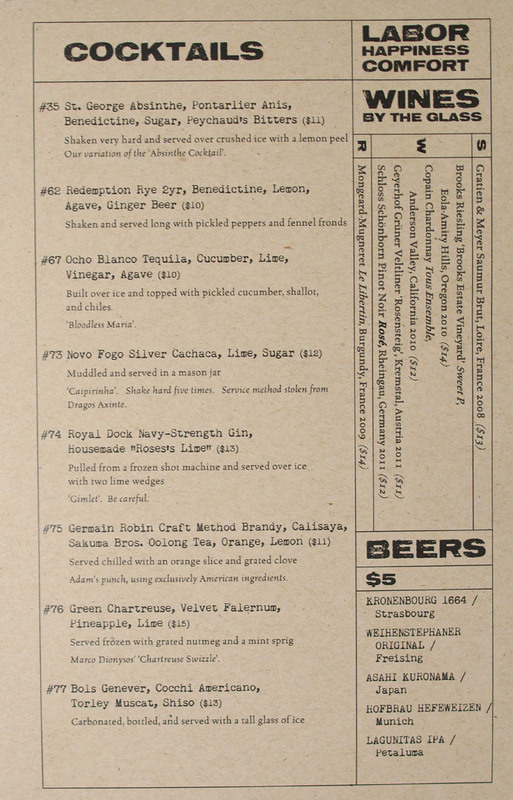 My favorite of the trio, though, was #62, with its slightly saccharine, almost medicinal flair, amped up by the whiskey but also beautifully counteracted by the spicy, piquant smack of the ginger beer. We commenced with what must be the smartest, most complex bowl of corn that I'd ever eaten. The inherent sweetness of the corn was on proud display, emboldened by the custard and keenly augmented by the lushness of the sea urchin. At the same time, the chervil jus, lemongrass, and ginger contributed a contrasting herbaceousness and spice that did a great job in moderating the sugariness of the corn, making for an eminently balanced, cohesive dish. Fantastic textures, too. I'm generally not a huge fan of carrots given their considerable sweetness, but what Kahn did here was pretty neat. The key was the guava, which added a distinct, fruity, saccharine undercurrent to the dish that somehow worked perfectly against the wonderfully charred Black Knights. It was a genius move, one that was duly followed up by the rich flavor of the dulse (a type of seaweed) in concert with the slightly bitter kale. The scallops were also commendable, their intrinsic sweet brine superbly accented by pricks of sourness from the kaffir, yet flawlessly combined with the jujube. At the same time, the whey provided a tangy, lactic temper to the course, while aromatic overtones from the verbena rounded things out. Beautifully integrated, and with a nice crunch from the turnip, too. 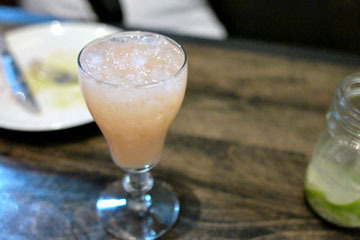 #35 - St. George Absinthe, Pontarlier Anis, Benedictine, Sugar, Peychaud's Bitters [$11.00] | Shaken very hard and served over crushed ice with a lemon peel / Our variation of the 'Absinthe Cocktail'. Round two of cocktails brought us #35, a potent drink with loads of anise flavor from the combo of St. George and Pontarlier, making for a medicinal, almost Tussin-esque experience that is definitely not for everybody--order responsibly. #77, meanwhile, was much more easy-drinking, with a delectably light, bittersweet character from the Cocchi that melded seamlessly with the sweet, juniper-tinged jenever and grassy kick of shiso. Eggplant was hearty and buttery, with a rich, complex taste interleaved with a nice touch of smoke. 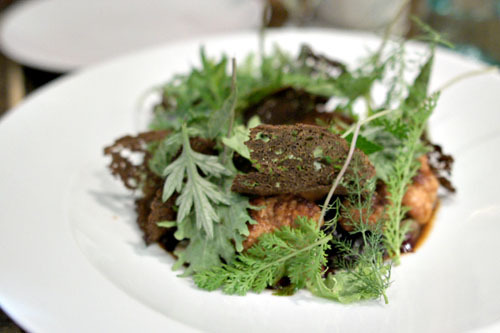 The combination of various greenery in the dish made for a bright, verdant counterpoint to the vegetable, but the incorporation of black radish into the mix was too much for me, its fiery, bracing astringency dominating the dish. 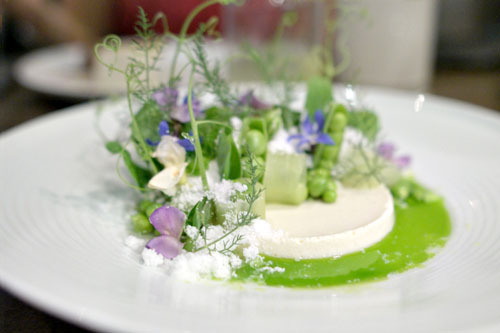 The snap peas were another standout course, really showing off the pure, unmitigated essence of the vegetable, brightened up even further by the use of mint. The soymilk, meanwhile, served as a rich, creamy base to the dish, moderating and grounding the levity of the peas perfectly. Very well composed, and a gorgeous mishmash of disparate flavors that come together in stellar fashion. Sweetbreads were unabashedly savory (almost too much so), with a considerable depth and weight duly enhanced by the smoky bone marrow and bittersweet chicory. The rich, hearty organ meat was certainly tasty alone, but the tempering effect of the mustard and leeks was key, as was, surprisingly, the saccharine nature of the prunes. 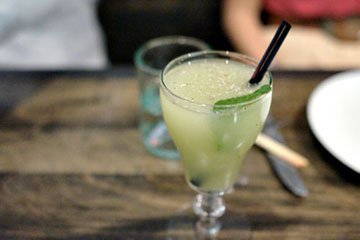 #76 - Green Chartreuse, Velvet Falernum, Pineapple, Lime [$15.00] | Served frozen with grated nutmeg and a mint sprig / Marco Dionysos' 'Chartreuse Swizzle'. #67 - Ocho Blanco Tequila, Cucumber, Lime, Vinegar, Agave [$10.00] | Built over ice and topped with pickled cucumber, shallot, and chiles / 'Bloodless Maria'. Our last round of cocktails started with #76, which I rather liked, with its deft interplay between the sugary falernum and the herbal, pungent nature of the Chartreuse, all finished with the fruity tartness of pineapple and a hint of sweet spice from the nutmeg. I wasn't as enamored, however, with #67. 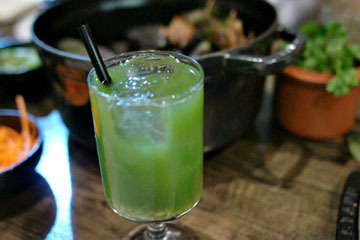 It had a good balance between the cucumber, lime, and tequila elements, but the vinegar and pickles took the drink in an overly tart direction. Moving on into some heartier dishes now, Kahn's slow-roasted lamb was excellent, supple and satisfying in consistency, with some deep, dark, spicy flavors that were smartly paired against the ripe, fruity sweetness of the mango--a perfect counterpoint to the meat. One of my dining companions even likened it to "lamb pastrami." Lovely crunch from the fried tofu chips, too. 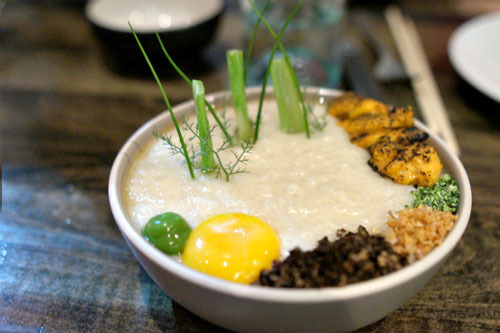 The porridge is one of Red Medicine's more popular items, and it's obvious why. It's a comfy, cozy dish, and easy to like. The rice, hot and hearty, formed an immensely earthy, savory, luxurious base to the dish--amped up even further by the egg yolk--and would've been enjoyable all on its own. To that, I loved the brine imparted by the sea urchin here, its sweet-saline nature duly enveloped by the porridge, but somehow still shining through. Great crunch from the use of hazelnuts as well. 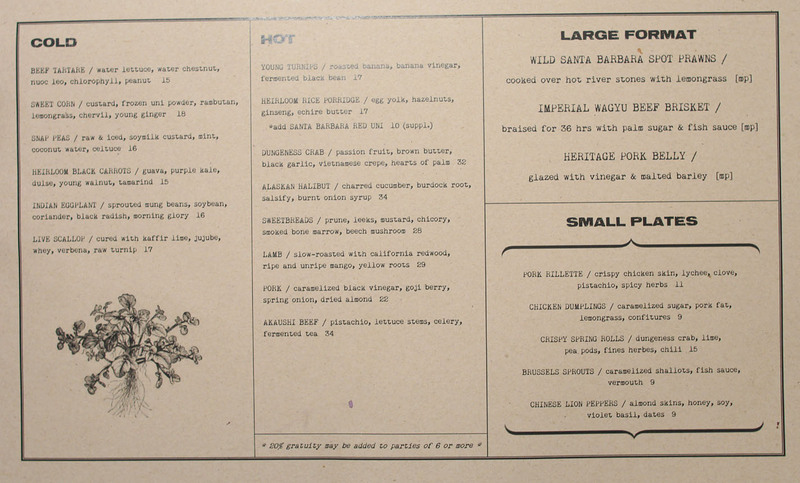 Here we had our first of two large format dishes. 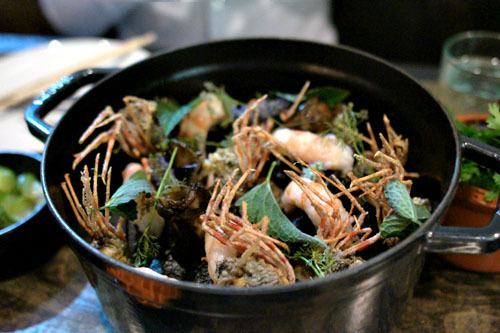 The spot prawns were spot on (pun intended), with a gorgeous snappiness and crunch to 'em--not overdone at all--and showed off their trademark ocean-y relish admirably. 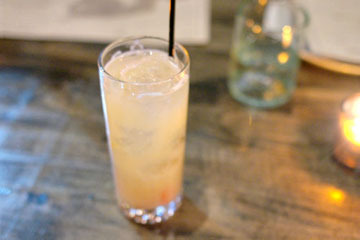 The heads, meanwhile, were on point as well, with a great hint of lemongrass flavor all encased in a crunchy wrapper. Rounding out the savory section of dinner was this somewhat massive, impressive portion of wagyu. 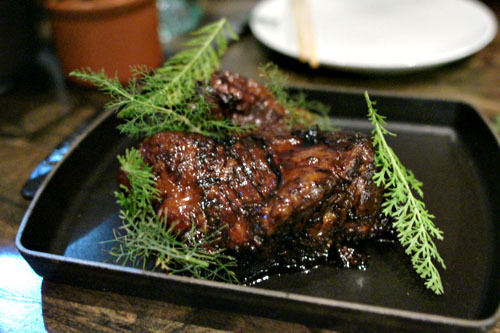 Not surprisingly, the brisket was a joy to eat, tender and toothsome, displaying boatloads of luscious, dark, bovine flavors, set off by a twang of sweetness and a punch of piquancy from the fish sauce. Delicious alone, the meat was even more enjoyable when consumed concurrently with the included sides of cucumber, onion, carrot, butter lettuce, and cilantro, which made for an uncompromisingly balanced, utterly integrated bite. Given Chef Kahn's background in pastry arts, desserts are an absolute must here, and arguably the tops in the City. Click for a larger version. 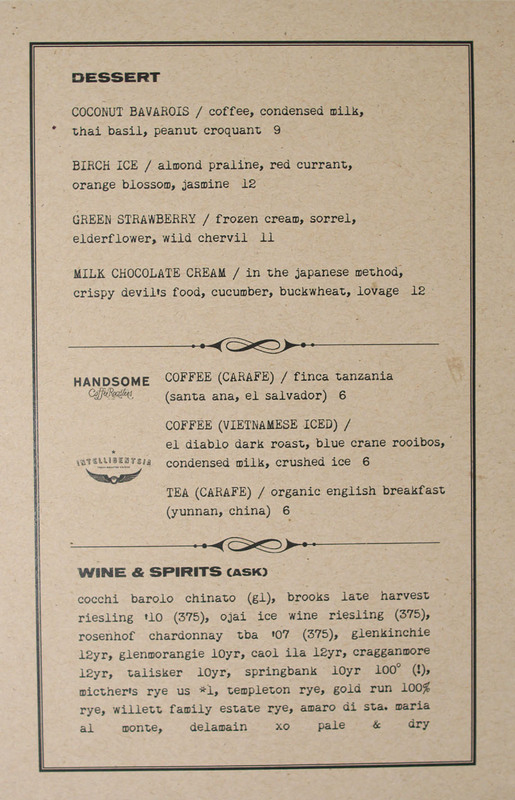 The sweet stuff started off with what has become Red Medicine's signature dessert, and for good reason. The interplay between the coconut and the coffee was something to behold, a balance of sweet and bitter flavors that led to a delightful touch of nuttiness on the finish, all under a whisper of Thai basil. Texturally, the dish was just as impressive, with the lush Bavarian cream playing off of the croquant and coffee with smashing results. I'm going to go out on a limb here and declare this the best dessert of the year, and probably among the top five I've had, ever. Yes, it was that good, and even managed to impress the likes of Saison's Joshua Skenes and Townhouse's John Shields, two of the heaviest hitting chefs out there. On my first bite, all I got was the jasmine cream and orange blossom bubbles, making for an almost soapy tasting experience that I found off-putting. However, the dessert just got better and better with each bite. 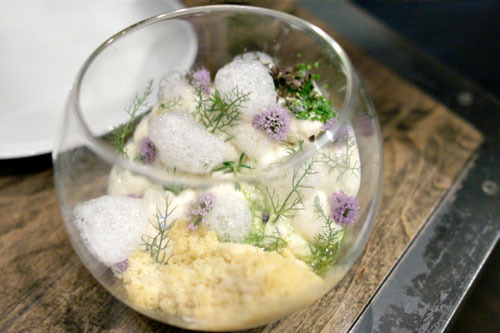 The floral, aromatic nature of the jasmine-orange actually worked flawlessly against that intriguing birch ice cream, which was sheer genius, and I can't forget about the base of currant, which served as a sort of omnipresent, sugary undertone to the dish. 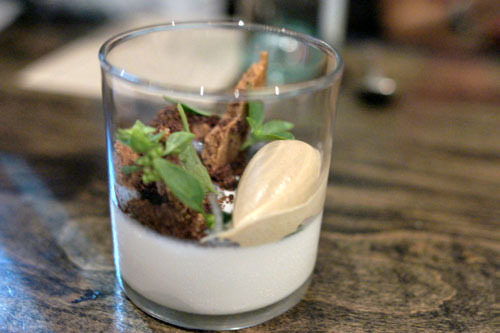 Loved the textural element of the almond praline, too, as well as the Alinea-esque plating. 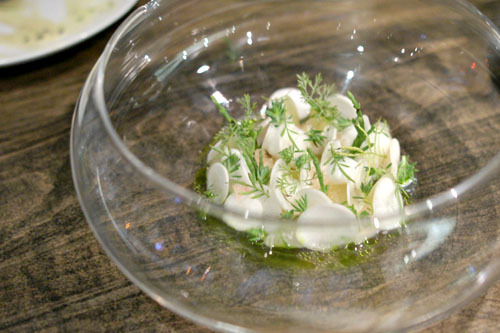 This is, quite simply, Jordan Kahn at his finest, and I don't think there are too many other chefs out there who could pull off something like this. Up next was perhaps Kahn's homage to the classic pairing of strawberries and cream. 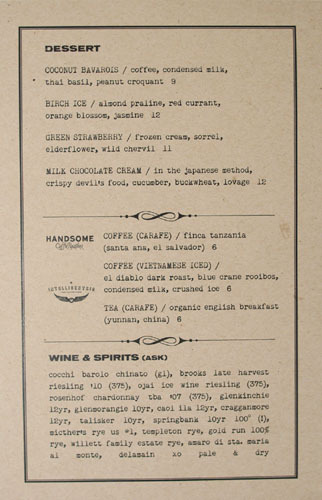 Instead of regular strawberries however, the Chef went with the unripe varietal, which conveyed a marked sourness to them that played well off of the sweetness of the frozen cream and elderflower syrup. 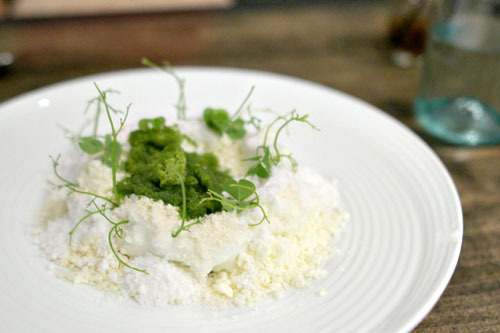 A dessert of bright, bracing flavors, tarted up by the sorrel and chervil--very nice. Last up was a rather striking looking dessert, one featuring a chocolate "cage" hiding a Japanese milk chocolate ganache, among other ingredients. 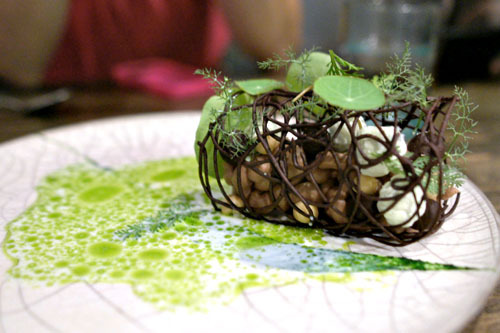 The chocolate melded admirably with the nutty character of the almond and buckwheat combo, while the use of cucumber, nasturtium, and lovage imparted a fantastic brightness to the course that I adored. Another strong plate from Kahn, and probably the best use of cucumber in a dessert that I'd ever experienced. After a very rough start, things seem to be going well here, at least as far as the food is concerned. The cuisine seems to have matured somewhat, resulting in even more nuanced, multifaceted dishes that seem to be less reliant on overt Vietnamese influences. In fact, some of the plates were among the best things I've eaten all year, and I was fed flavors and combinations that I'd never quite experienced before, quite a feat given my jaded palate. 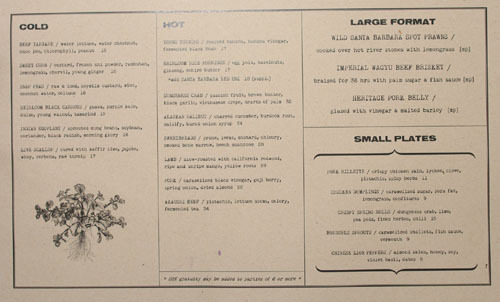 After my first visit, I'd been always of the thought that Kahn's cooking was among the most ambitious in the Southland, and that rings even more true today. 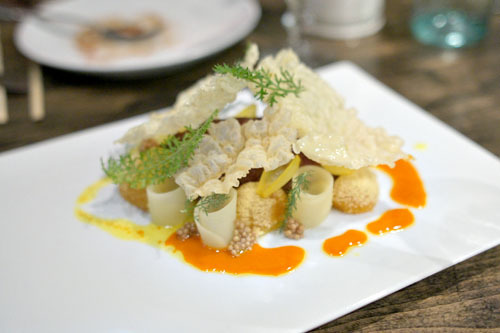 I get that there's a sense of arrogance and pomp to the restaurant, but I would try to look past prejudices and Red Medicine's considerable baggage and open yourself up to some of the most progressive cooking that's ever hit LA. That they survived that whole affair for two years in such a competitive industry, shows that something is done right. Surly waitstaff is mot my thing, but then neither are college student servers who keep padding my back every five minutes to find out if all is good. I'm really loving Red Medicine now too. 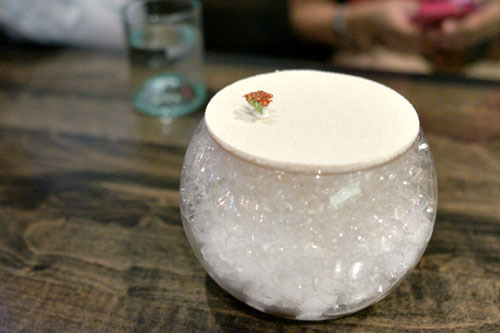 That birch ice dessert is amazing! H.Peter: Indeed. That "something," no doubt, is the cooking. Chris: I just read your latest post on RM. Sounds like the tasting menu is the way to go next time. 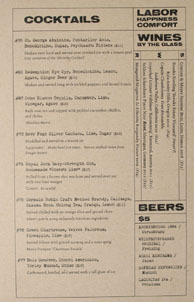 10 courses for $85 is a deal! Offalo: I'm so over Chowhound and their power tripping moderators. That board's been in decline for years, and with good reason. May I ask where is rm?